A New Zealand manufacturer that has gained major local and export orders for fencing components is using production automation technology from Enerpac (A Division of Actuant Corp) to help achieve the required production efficiencies. Auckland based Crighton Engineering and Manufacturing Ltd has supplied major orders for electric fencing products for the Tru-Test Group of agritech and manufacturing businesses operating in New Zealand, Australia and USA and exporting into 70 countries. 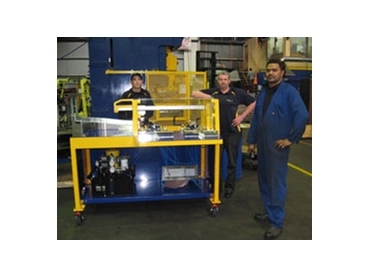 George Pavletich of Enerpac Distributor Jonel Hydraulics said that, in working with Crightons to devise an automated table to achieve their requirements, Jonel supplied technology from Enerpac’s Workholding range. This included an energy-saving ZW5-Series pump with stackable VP-Series Solenoid Valves and CST-40132 threaded cylinders with a pushing force off 39.9kN at 350Bar each. “To work with Crighton right from the start and come up with a solution of an automated table that can load and bend the “pigtail” design fencing, crimp the foot and then unload the finished pigtail as one process has been really satisfying” he said. “Enerpac produces a full range of well-designed, versatile and reliable workholding products which provide users with dependable production automation solutions in virtually every type of manufacturing process” he said. Crighton’s Manager Mike Grunig said contracts for Pigtail and Treadin products has been a real success story – “And it has been a real test for the company to make sure all our processes and materials supply were competitive enough to ensure we could manufacture at a better price than what they had been getting from China. “While the drop in the dollar and reduced stock holding for the customer helped to secure the contract, our quality control and our commitment to product development gave us a competitive advantage” he said. Mr Grunig said the contract resulted in the company employing seasonal staff to produce the 800,000 Treadin and Pigtail standards per annum that Tru-Test sold in New Zealand and to overseas markets. Enerpac technology incorporated into the Jonel design included Enerpac’s energy-saving ZW series hydraulic pump engineered to run cooler than conventional designs while offering greater durability, lower operating costs and simpler service. Enerpac used the latest metallurgical, bearing and seal technologies to produce a pump that reduces the number of moving parts required, improving flow dynamics and decreasing friction. The 350 bar single-stage pumps provide increased flow rates with lower heat generation and a decrease in power consumption, which means increased tool speed and increased service life, said Mr Pavletich. The CST cylinders incorporated into Crighton Engineering’s automated table were from Enerpac’s comprehensive range of linear cylinders, while the VP series solenoid valves were drawn from Enerpac’s complete line of valves and accessories to complement any hydraulic system, he said.